The solution lies in what sort of bee you have. 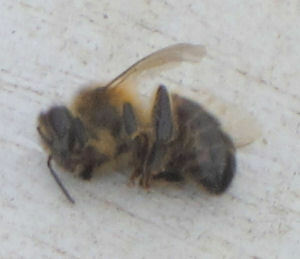 Bees only live for a few weeks, and when they die their sisters carry them out and drop the body within about three metres of the entrance. 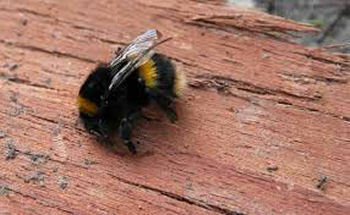 Look on the ground within three metres of the entrance to find a dead bee then choose which sort you have for a cost effective solution. My bee has black shiny legs has a dark brown back and has gold and dark brown segments on it's abdomen.